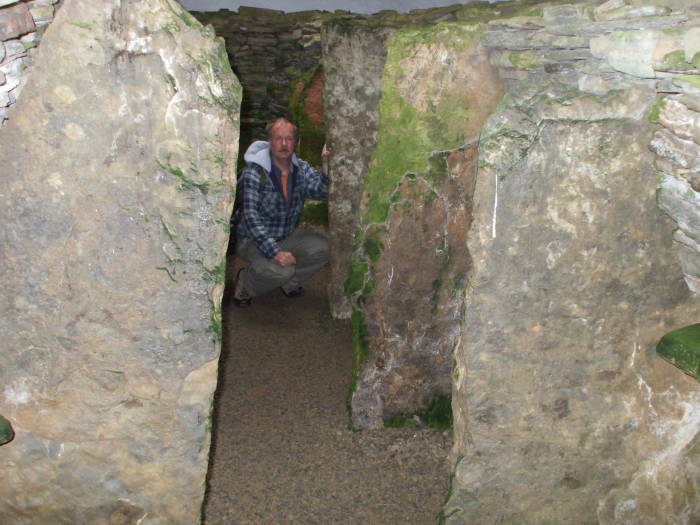 The Knowe of Onston is a chambered cairn located at HY 282 117 in the U.K. National Grid system. 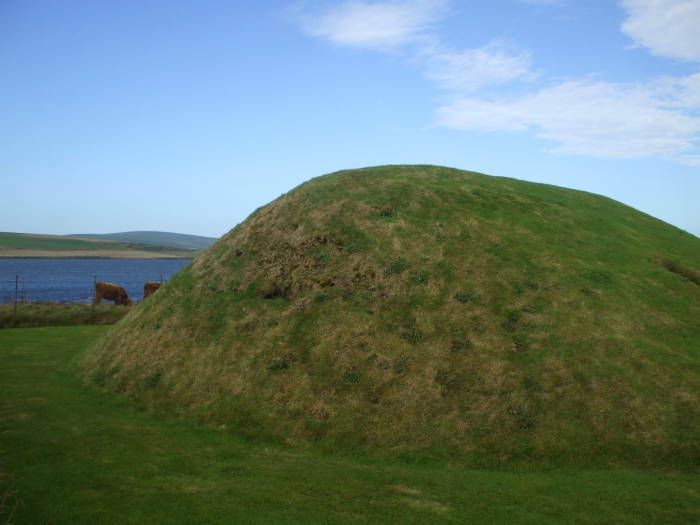 It's a barrow or mound tomb built between 3500 and 2500 BC. Let's look inside! You can easily get there on a bus from Stromness to Kirkwall. Tell the driver you want to get out just east of the Bridge of Waithe, where there is a small opening from the Loch of Stenness to the Bay of Ireland and out to the sea. Just east of the A 964 intersection, itself maybe 150 meters east of the bridge, there is a lane to the north, leading to a house near a small tip of land in the Loch of Stenness. Walk down that lane, around their parking area, and to the Knowe of Onston. The barrow or mound is circular, 13 meters in diameter. Evidence from this tomb and similar nearby ones indicate that they were built some time between 3500 and 2500 B.C. This was a burial place for the farming community who lived in this area over 4,500 years ago. It is part of a wider network of Neolithic and Bronze Age settlements, burial and meeting places that are found around the shores of the Lochs of Stenness and Harray. 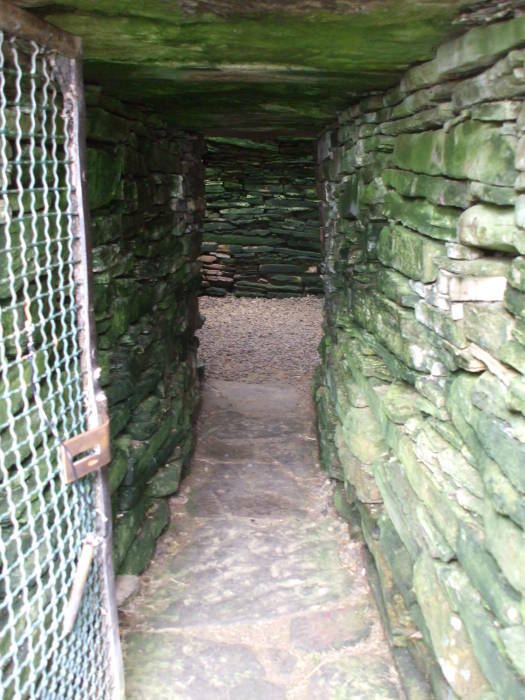 Excavated in 1884 and 1934, the cairn now has a modern roof. 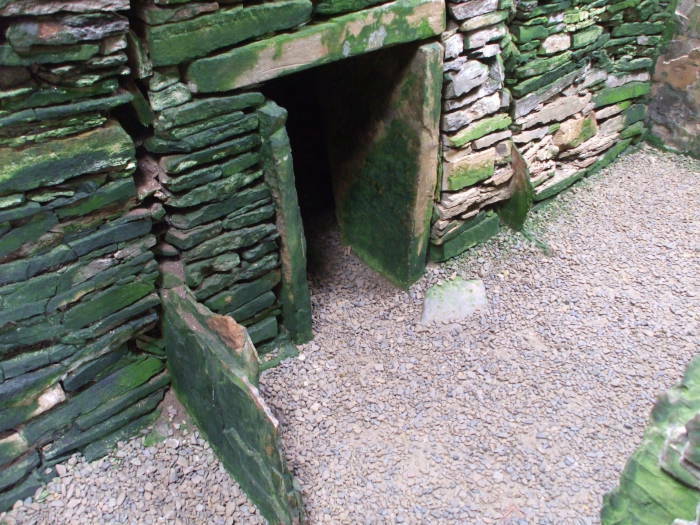 A narrow entrance passage leads into a roughly rectangular chamber, with a smaller chamber leading off. 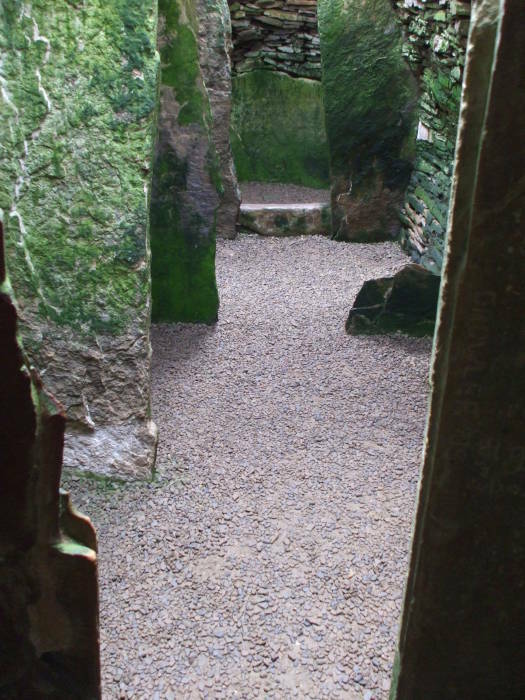 The main chamber is subdivided by upright stone slabs into compartments or "stalls". The excavators found tumbled human bones in each compartment of the main chamber, while in the small side chamber were two crouched skeletons, more or less complete. The ways in which chambered tombs were used probably varied, but here it's possible that the recently dead were placed in the side chamber and, after an appropriate interval, their remains removed and placed in one of the stalls. A few well-made flint tools were also found, together with a large number of pottery bowls of a type found in many Orkney tombs and now called "Unstan Ware". These vessels may have contained food or drink and were buried either as provisions for the after-life, tributes to long-dead ancestors, or offerings to the spirit world. Without any knowledge of Neolithic religion we can only guess. We can only guess, too, at the ceremonies associated with interment and with the periodic clearing and tidying of the tomb. And there may have been other ceremonies held here not directly associated with the dead. 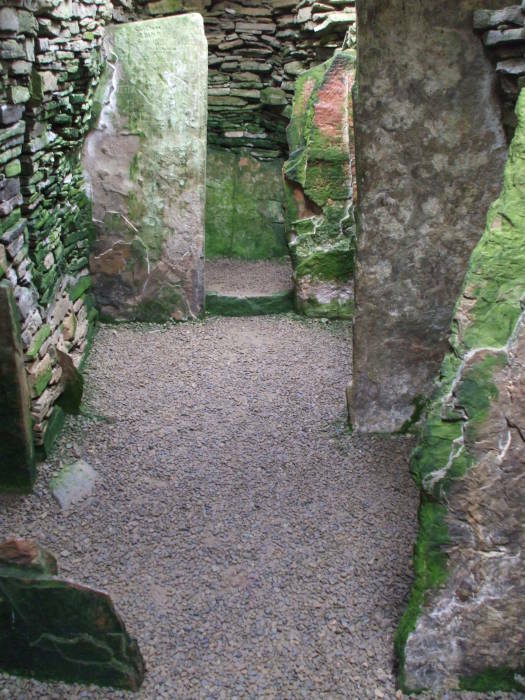 What can be said is that the effort expended in constructing tombs, and the fact that many were in use over long periods of time, shows that they were of great importance to their builders and must have played a central part in the organisations of Orcadian society between 3,500 and 2,500 BC. The cairn was built as a roughly rectangular stone structure, then covered with earth. Here you see the narrow entrance. Unlatch the gate keeping the local livestock and wildlife from setting up camp, and crawl down the tunnel entrance. The entry tunnel is about 1.5 meters high and not very wide. The main chamber is nicely illuminated by some translucent panels in the replacement central roof built by the 20th Century investigators. The vertical stone panels divide the "stalls". There are five of these stalls along the 6.4-meter length of the chamber. 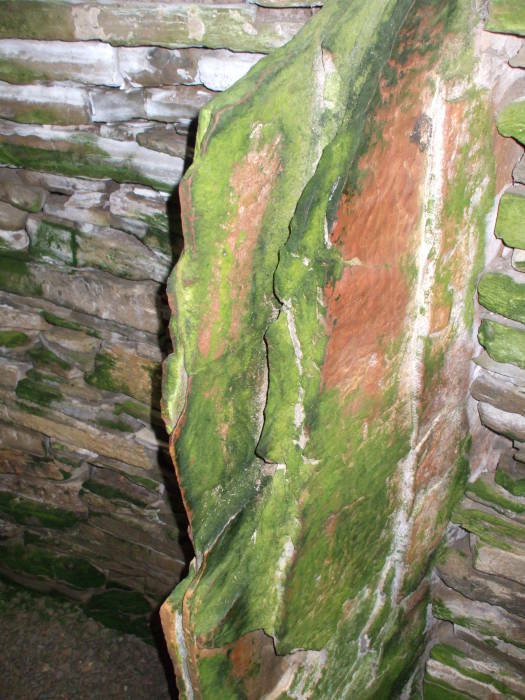 The remaining drystone walls of stacked local flagstone are about 2 meters tall. Large sandstone panels form the dividers. The walls are built up from more rectangular and regularly shaped blocks. Many of the panels dividing the stalls have very sharp and straight edges. The local sandstone lent itself to a variety of construction techniques. This is the small entry to the side chamber where the two more or less complete skeletons were discovered. The fragments of the Unstan ware bowls showed that they had been used, they were not created for the burial ceremony. They had, however, been shattered, intentionally broken before being buried with the dead. Several of the fragments were found in a shallow hollow in the tomb's floor, a common pattern for tombs of this era. 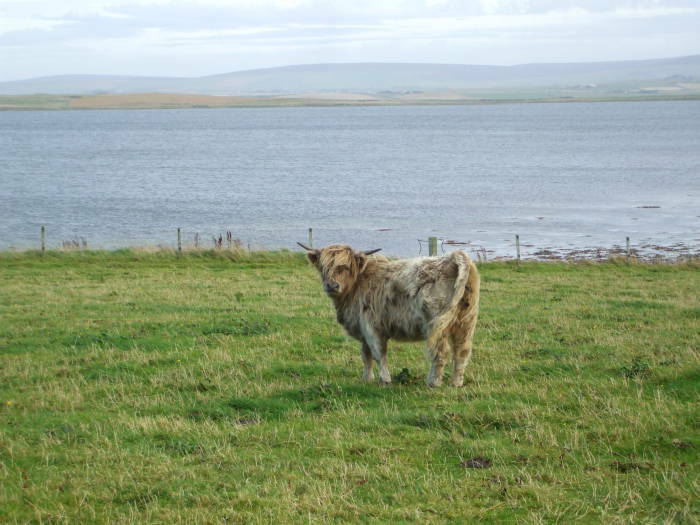 One of the local hurry coos is watching from the adjacent pasture. Across Loch Stenness the Ring of Brodgar is at the left, the Stones of Stenness near the center, and Maeshowe to the right. 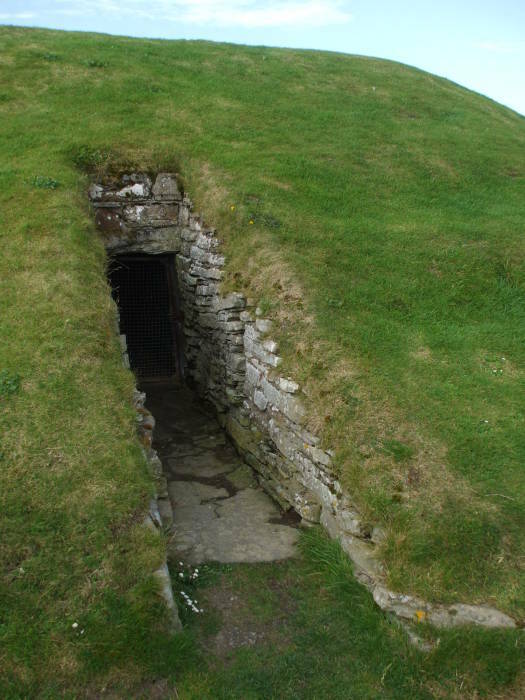 Maeshowe is our next stop.